Yes, awesome quality with this one. I've already used it in two recordings destined for release, and even dropping it in mixes with my hardware Virus Indigo, it holds up absolutely fine.I'll add the velocity sensitive keyboard –as you slide up the key, you open whatever the velocity is controlling –as a huge expressive plus. Newbie musicians will also love the error-free keyboard; pick a root note, choose a scale, and only keys in that scale will appear –there are no wrong notes.Agree completely on the overdub/record function –really good for creating complex, Frippertronic-style loops. Only drawback I found was no internal arp/sequencer. 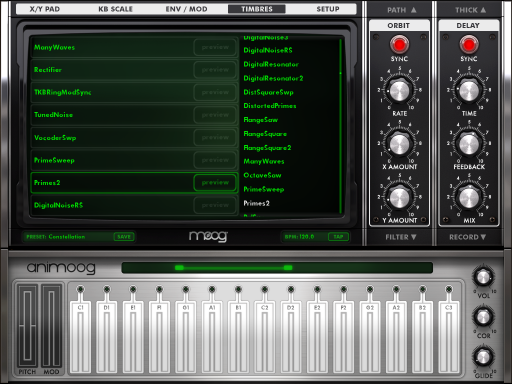 Of course you can drive it using MIDI from elsewhere, but this still would have been nice. 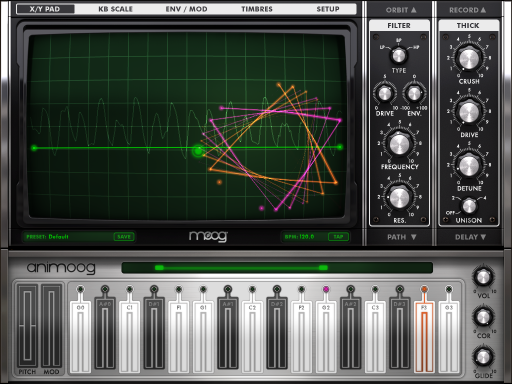 Yes, Animoog really is an awesome piece of equipment.But this really is best played on the iPad itself, without a MIDI keyboard controller. The expressiveness in the keys (up-down sliding coined poly-pressure if I'm correct out of the top of my head) is great. Of course you can set it up so key velocity on your keyboard does the same, but it just doesn't feel like how it's meant to be.Animoog really is made for the iPad and it's very cool! 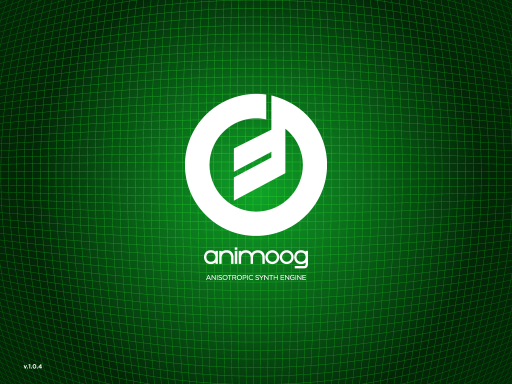 Anyone who just downloaded the Animoog update having difficulties with it crashing, just delete Animoog, and re-install. 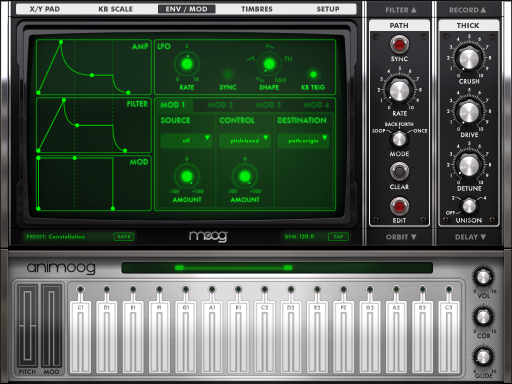 It's best to back up any user patches before updating, Moog warns all user patches will delete. You must back them up via iTunes file share prior to this new update. I followed Moogs directions and I've had no problems at all.